First things first, What is a swag bag? Derived from the Latin word Swagatolli it's the bag that holds your essential utensils for a night out. OK, we just made that up. The word swag actually has its origins in Scandinavia but I digress. Who cares about the origins. The clock is ticking and you've got to get it together. Focus. A swag bag is a bag with a collection of gifts to be handed out at an event like the Oscars or other events like your humble corporate holiday party. The items in the bag are usually promotional in nature in that they have a company logo on them. So it's a cross between a gift and a promotion product. The word swag is slang for promotional products or marketing materials with a company name on it. Swag is also sometimes called chotskies. Swag bags are there to remind your employees or clients of the products or services you provide. Whether it's a simple swag bag for a company picnic or the ultimate swag bag from a star-studded event, every bag's purpose is to advertise, build your brand, and simply say thank you. Typically some items in the bag will have a logo imprint and others may be something simple like a chocolate bar or bag of snacks without your logo. How much will you be spending on each bag? Maybe it's $15, $50, or $500, the important thing is to start with a budget and stick to it. Keep in mind that the best number of items for a swag bag is between four and six. Too many items and you'll be spreading your budget too thin. Too few and, well, it won't really be a swag bag, right? The bag sets the tone for the entire corporate gift so make sure you choose one that fits the message. A sleek, black bag with gold lettering promises a luxe gift set, a polka dot beach bag says these products are going to be fun, and a backpack may tell them there will be something useful in their swag. You'll be spending some of your budget on the bag, so make sure it is the type of bag the recipient is going to want to keep. Once you've selected the bag and narrowed in on a theme, your swag bag ideas will start to flow. It's now time to choose the products that best suit your theme and marketing needs to create a swag bag your employees or clients will love and one that will impress your boss. When selecting items think about the feeling you would get if you received the item. For example, a stuffed animal may make you smile. A chocolate bar may give you that special 'Yeah!' feeling. A water bottle may make you think, Cool I can use this. Also, consider the event itself. If it's an outdoor event then a water bottle or sunblock may be perfect. If it's a long event, then maybe some snacks. Now that you have selected your products, determine which art you would like printed on each item. If you have an ace art department let them know which items you're getting and let them work up some amazing art for each item. It's often best to name each art file with the name of the item it is to be printed on. Once your art is ready, place your orders. Keep an eye on the in-hands dates to ensure everything arrives in plenty of time. If you're in a jam and waited a little too long to get started, companies like Blueberry Ink have thousands of custom printed items that can be shipped in a rush. Many can ship within 24 hours. Here are some of our favorite combinations of items to go in a swag bag. Notice that the bag selected is the starting point of creating your bag and will set the tone for the collection. To get started with our sample swag bags we'll go with a simple paper bag. They're inexpensive but a great way to have your logo or event message proudly displayed. The stuffed animal, in this case an elephant, will be the first thing they notice and grab onto. Again, ensure that your logo is printed on most of the items in the swag bag. The sport bottle will be one of those items they use a lot, so it's a nice item to include in the collection. Flashlights are fun if it's an outdoor evening event. Then the high value item in this bag is the wireless phone charger. They're not going to throw that one out. It's a keeper. We finish this swag bag with a smile. It's a delicious pack of M&Ms. Now everyone wants a bag. We call this the traveler's swag bag because it has so many essentials for the traveler. We start with the bag itself which is a drawstring tote perfect for those on the go. Then inside that bag is another small bag which can help keep small things easily accessible. The customized passport holder tells the whole story: this is a traveler's kit. And of course a notebook to keep your travel journal going. The granola bar will be just what your traveler needs. If it's a hike, you may want to toss a few more snacks into this swag bag. Fun is the theme of this corporate swag bag. By using a clear tote for the bag everyone will see what they're about to get. With the logo t-shirt teddy bear peaking through the clear tote, they'll be smiling even before they get the bag. The umbrella can add a lot of color to the see-through bag and the tumbler engraved with your event logo will be the premium item in the collection. An executive pen gives this goodie bag a high-end twist and the mints which you can just pick up at a big box store makes those meeting more pleasant. This swag bag starts out with a custom printed power bank which is a popular item especially if people have traveled to the event. Having a power bank makes those long days away from home easier. Then we drop in an executive journal great for conferences or conventions. The umbrella is a 'must have' if the event is expected to see some rainy weather as many may have left their umbrella at home. We finish this collection with a little chocolate which will put a smile on their face when they're checking out their goodie bag. In this high-end swag bag we've included a Moleskine journal, a Bluetooth speaker, a Cross pen, and a Starbucks gift card. By including brand name items in your bag, it becomes a high perceived value collection. Also notice in this swag bag the bag used is not just a simple bag, but a lunch cooler. Remember to have fun with your art! Promotional products and corporate gifts typically only have a company name and logo, but there are so many other things you can do to make your products stand out. If you have a killer art department, let them have a little fun by creating a unique art file for the bag touting the event. Whether it's a play on words, a cool design, or a completely off the wall idea that will undoubtedly be remembered, be unique in your advertising methods, especially for something as fun as swag bags. On this notebook, we not only put our logo at the bottom but we also put "Brillian IDEAS" with a light bulb making it a fun promo item. For our custom umbrella, we printed "Rain Check" on one side and our logo on the opposite side. How Far in Advance Should I Order My Swag Bags? Timing is everything. Make sure you give yourself enough time to set your budget, choose your promotional products wisely, and have them ordered and delivered well in advance of the event. We recommend giving yourself at least a month for your swag bags. You can spend a week setting your budget and choosing your products, another week creating your art and getting the order placed, and still have plenty of time to get your order delivered and checked by you. Plan on getting your products at least a full week before the event. The last thing you need before an important event is to be waiting until the last minute for your boxes to arrive. Plan early, place your order early, and have it all done in plenty of time. Here are some different themes to consider for your swag bag. Sometimes, trade shows and other events may be monotonous or a bit tedious (a.k.a. boring), so offering a fun swag bag will give the attendees something to do to liven up the place. Some great products to include in your swag bag are customized mugs with funny sayings, stress relief balls, customized games, or a t-shirt that says I survived the *insert event name* trade show. This type of bag can also include customized snacks or candy to rejuvenate the attendees and allow them to get through all of the presentations with ease and sugar. For this type of swag bag, discover the items that your clients and employees will love by focusing on their hobbies and pastimes. Do your employees enjoy a round of golf, hiking through nature trails, journaling, or another specific hobby? Your swag bags can include items that will encourage their relaxation by providing useful tools for that activity. Golfers always need extra golf balls and accessories and hikers can always use a good custom backpack or a good food storage jar and water bottle to get them through that trail. A person who experiences wanderlust may enjoy getting travel items that follow airport protocol and encourage additional trips and a music lover will love a good pair of headphones or a Bluetooth speaker. There is nothing like a relaxing day at home and there's no better time to connect with your clients than when they are comfortable and at ease in their own space. The Home Bag may include customized drinkware, custom blankets, food storage containers, tablet stands, cutting boards, and so many more items that your client can use while sending time in their abode. The idea behind this bag is to include items that are useful and will remind clients of your company's brand and mission at a time when they are not trying to send that last email or dropping their kids off at school on time. A little rest and relaxation never hurt anyone and it is necessary to maintain some semblance of normal in today's modern world. The personal care bag will do just that with items specifically chosen to help clients and employees unwind after a long day. Spa gift sets are always a good option for the personal care bag, as are aromatherapy oil diffusers, manicure sets, massagers, and compact mirrors. By making clients and employees feel calm and comfortable, you'll be making a positive connection from them to your brand that will keep your business at the forefront of their minds. Every office has the wine enthusiast, the workaholic, the gym rat, the techie, and any other type of person with specific interests. 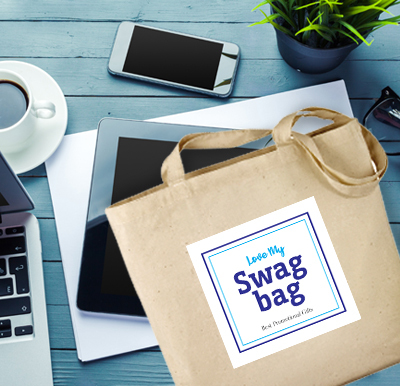 Much like the hobby bag, this swag bag focuses on the individual person or group of people to create a customized swag bag they will love. This is where personality and fun come together with customized beer glasses, custom gym bags, personalized power banks, and so much more. Work can be stressful, especially if you don't have the proper supplies to get the job done. Custom padfolios and notebooks, high-quality promotional pens, briefcases, executive desk gifts, and other work-related corporate gifts can help your employees and clients get organized and become more efficient during their workday. Try to find the promotional products that will benefit your employees and clients the most and put those in the swag bag to decrease their work-related stress. This combination of goodie bag ideas will ensure there will be at least something the recipient will love and something else they will definitely use, and your marketing efforts won't end up in the trash at the end of the day. Need some help planning the ultimate swag bag for your event? Our friendly team at Blueberry Ink is always ready to help you find the right products for your brand. Contact us for some swag bag ideas and know you are receiving the highest quality products and the best service to make you look good at your next event.